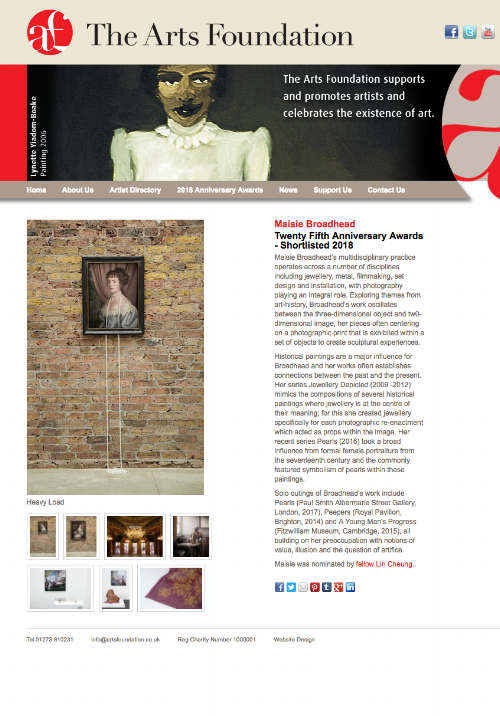 Artists Caroline Broadhead and Maisie Broadhead are mother and daughter have come together to collaborated for an exhibition at Manchester Art gallery called ReFrame. The exhibition presents new works in response to historic paintings of women by famous male artists who are represented in Manchester Art Gallery’s collections, including Lord Frederic Leighton and John William Waterhouse. Private Viewing: Friday 26 May 2017, 6-8pm. Selected works from the new series Pearls along with other pieces will be on show at Paul Smith - 9 Albemarle Street till the 24th October. Sarah Myerscough Gallery is pleased to present ‘Pearls’, Maisie Broadhead’s third solo exhibition organised by the gallery. On this occasion, the young British artist will present her latest series of photographic and sculptural works alongside a new video piece. I am happy to say I will be presenting new work as part of the Open Spaces - Mind Maps exhibition at the Nationalmuseum, Stockholm, Sweden in March this year. This is an exhibition of contemporary art jewellery and features 30 artists from around the world, with 160 works on display.